SatoshiBet is different from other types of Bitcoin casinos. It has a user-friendly interface with simple to use features. You can withdraw and deposit funds almost instantly. One of the things you will notice here is that you do not need to create an account and you do not need Bitcoins in order to play. The player receives play – chips and he can play games before any actual money is being deposited. If the player wants to use real money in the game, he will be given an address where he can send his BTC. After the funds are deposited, you do not have to wait for a confirmation that the transaction is completed as it done almost instantly. A thing that you must know is that the site uses units of Bitcoins – mBTC like 0,001 BTC. After the deposit is done by the player, who does not have to create an account, he will be able to choose between three types of casino games and they are War, Lucky 7, and Roulette. These three games have responsive and slick interfaces and they look better than most other games like this. If you do not know the three games, there is a help button in the top left, and here you can find the instructions for the game chosen. 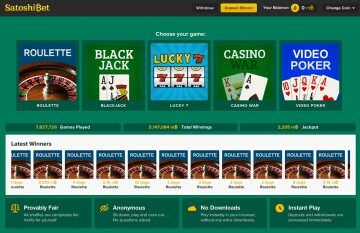 The player can adjust the multipliers and the amount bet in every game. If you want to play the game Roulette, your winning odds are showing through the help button. Although most websites do not do this, Satoshibet outdoes itself and displays all types of paying odds. To describe it in a few sentences, the game Roulette involves the computer spinning a wheel where a ball has to land on a number between 0 and 36. The player has to choose the number on which the ball will land and he can win depends on how many numbers he selected. For instance, if the user selected the number 8 and wins, he wins less than if he selected 8 and 15. The player has an expected return of about 97 %. The simplest game on the site is the Casino war. In order to play, you have to determine the size of your bets. After this, two random cards slide on the screen. The winner is the one with the highest card value. The maximum amount per bet is 1000 mBTC while the minimum is 0.001 mBTC. The player’s expected return is about 97 %. The third game is called Lucky 7, which represents a classic slot machine game. The modifiers of the game can be found through the help button. It has nice graphics and the transitions between the machines’ spins are smooth. Because the jackpot is presented in the middle of the screen, the player will also yearn for more. The interface for this game is not complicated as it includes the amount wished for betting, the auto – spin feature and the spin button. If the player chooses the auto – spin button, he can simply input the amount he wants to bet and let the game replay. This can be a relaxing and nice experience if the player does not desire to bet too much. In this game, the maximum amount is 50 mBTC and the minimum is 0.001 mBTC. The player’s expected return is 99, 6 %, which is astonishing considering it is a gambling game. The website Satoshibet is currently developing a poker game. Although there already are three rooms where one type of poker can be played, there still are very few players. Because the tables and lobby have an appealing interface, it is expected that more players will join.